**** Chosen by Winner: Brian S.
Hogue is proud to bring you their first OTF (Out the Front) automatic, a revamped take on a tactical classic and another spectacular design from Allen Elishewitz. The Hogue OTF features double-action deployment at incredible speeds using the prominent side mounted thumb slide. Built with a lightning fast spring opening action, these knives provide exceptionally effortless opening action and superb ergonomics. With solid lock-up, this is a knife designed to be used and abused. 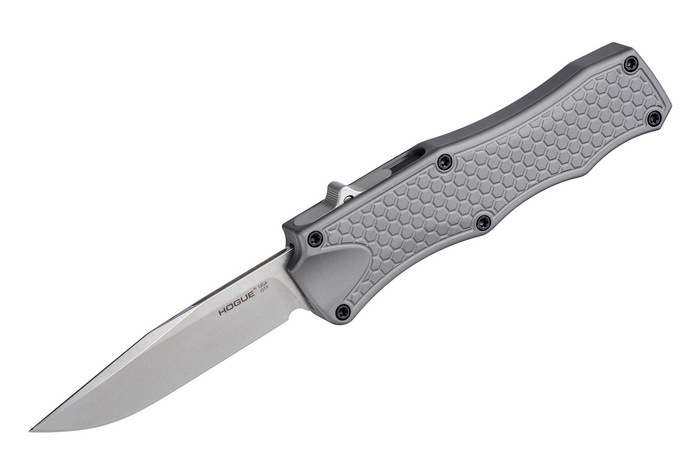 The contoured aluminum handle has Hogue's tread pattern for additional grip traction, a deep-carry pocket clip, smooth, consistent action, and excellent fit and finish.